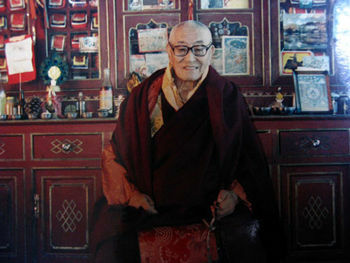 Saljey Rinpoche (1910-1991) — former retreat master of Tai Situ Rinpoche's Sherab Ling Monastery and one of Mingyur Rinpoche's main teachers from the Karma Kagyü tradition. Saljey Rinpoche was born in Nangchen, Eastern Tibet. He was recognized as Saljey Rinpoche by the Fifteenth Karmapa, Khakhyap Dorje. He studied the sutras and tantras at Palpung Monastery for four or five years, and also received all the oral instructions of the three-year retreat from the Second Jamgön Kongtrul, Palpung Khentse Rinpoche, and Palpung retreat master, Lama Tashi Tsering. After completing his studies he returned to his own monastery, located at Ripa Barma. There, he completed a three-year retreat following the oral instructions he had received. After the Chinese invasion he went to Sikkim, Northern India. He practised and meditated there until the Sixteenth Karmapa passed away in 1981. At about seventy-five years of age, he went to Sherab Ling Monastery to be close to Tai Situ Rinpoche. There, Saljey Rinpoche gave many teachings, empowerments, and was especially interested in preserving and passing on the three-year retreat instructions to the new generation of practitioners. This page was last edited on 17 December 2018, at 11:52.